Santosh Khadsare did his Bachelors in Engineering in Electronics and Communication stream from Pune University. 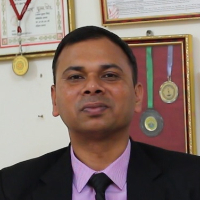 After that, he has done various courses in Digital Forensic Investigation such as CHFI, CH, CCI, RHCSA etc. from Asian School of Cyber Laws. He has been working as Digital Forensic Investigator since 2000. he is heading the Digital Fornesic Lab, Government of India, New Delhi. Digital forensics (sometimes known as digital forensic science) is a branch of forensic science encompassing the recovery and investigation of material found in digital devices, often in relation to computer crime. Digital forensics investigations have a variety of applications. The most common is to support or refute a hypothesis before criminal or civil courts. "After completing my graduation, I did various courses in Digital Forensic Investigation and have been working since 2000 as the Investigator. Currently, I am heading the Digital Forensic Lab, Government of India, New Delhi."